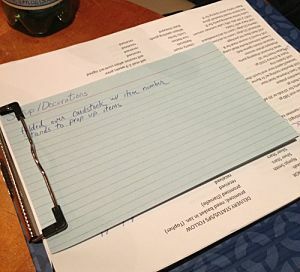 One 2014 Auction Chair has notecards labeled with different auction subjects. This card was “Setup / Decoration.” During our meeting, she would list all the tasks related to that topic on the card. It was a quick reference for her to see what else needed to be done. The reason being is that January is the month that many stores — Home Depot, Walmart, Kmart, Target, Staples, The Container Store (the annual Elfa® sale) — advertise one particular theme. Volunteer Auction Chairs need to be organized. They are often working with many volunteers to plan the fundraising auction. Keeping track of the big picture — AND the details — is part of the job. Do you have any tricks for keeping your charity auction organized? If so, share your ideas below. Thanks for the tip, Sheila! As usual – great article! I would put my vote in for Trello for managing auction items during the setup/procurement phase. Trello is a pleasure to use and easy to get up and running with it. We like it so much I would love to integrate it into Handbid in the future so that “approved/ready” items would flow directly into the auction system. On each card, you could track the item details (description, fine print, starting price, increment, donor information, etc. ), photos, etc. Trello is awesome. Trello and Bitrix24 are the best free productivity tools in the history of humanity. “…history of humanity.” That’s quite the vote of confidence, Nadya. Thanks for sharing.